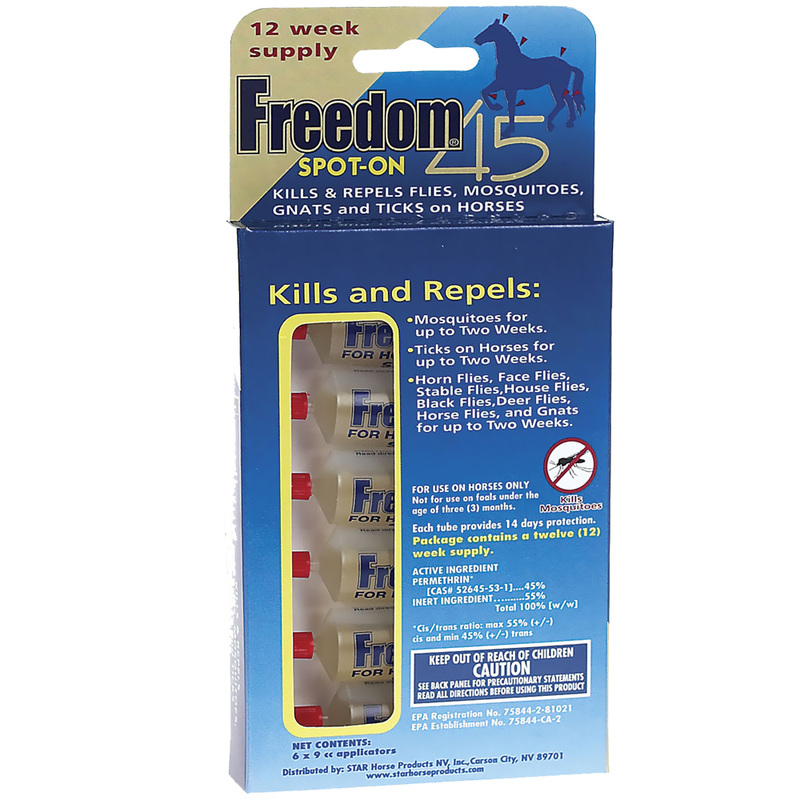 Freedom 45 Spot-On for Horses - 12 Weeks Kills and repels horn flies, face flies, stable flies, house flies, black flies, deer flies, horse flies, mosquitoes, and gnats on horses for up to two weeks. Also kills and repels ticks horses. Mosquitos for up to two weeks. Ticks on horse for up to two weeks. Horn flies, face flies, stable flies, house flies, black flies, deer flies, horse flies, and gnats for up to two weeks. For use on horses only. Not for use on foals under the age of three (3) months. Permethrin (CAS# 52645-53-1) 45%. Cis/trans ratio: max 55% (�) cis and min 45% (�) trans. Hold tube in upright position pointing away from user�s face and body. Break off tip or cut with scissors. Using the cc marks on the body of the applicator as a guide apply the Freedom 45 as follows by gently squeezing the applicator. 1. Streak 1 cc on the poll. 2. Streak 0.5 cc on each side of the withers (1 cc total). 3. Streak 1 cc on each side of the hindquarters (2 cc in total). 4. Spot 1 cc to the back of each front leg (2 cc in total). Caution: Harmful if swallowed or absorbed through the skin. Causes moderate eye irritation. Avoid contact with the skin, eyes or clothing. Wash thoroughly with soap and water after handling. Sensitivities can occur after using any pesticide product for animals. If signs of sensitivity occur, wash area with mild soap and rinse with large amounts of water. If signs continue, consult a veterinarian immediately. Keep out of reach of children. Environmental Hazard: This product is extremely toxic to fish. Do not apply directly to water. Do not contaminate water when cleaning equipment or disposing of equipment washwaters. Chemical Hazard: Combustible. Do not use or store near heat or open flame. I think this stuff is great! It didn\'t quit make the full fourteen days but when the fourteenth day came, there were only a few spots that had gnats on. I would say that it worked for a full 13 days! I reapplied after that. When you watch your horse, flies will land but not bite, gnats will not land but will still be around horses head. Mosquitos, and ticks are nowhere to be found!!! I highly recommend this. The flies just drive my horses crazy and this works great. There are cows across the driveway but using this product cut the flies down to almost none. Significant difference between the horses that got Spot on and those that didn\'t! Freedom 45 Spot-On works great! I have been using this product for over a year now. I have not found anything that is better!